Jammu & Kashmir, located in the extreme north of the country, is situated between 320 17' and 370 5' N latitudes and 720 40' and 800 30' E longitudes. It is bounded on north by China, on east by Tibet, on south by Himachal Pradesh and Punjab and on west by Pakistan. Geographically, this state is divided into four zones – the mountainous and semi-mountainous plain known as Kandi belt, hills including Siwalik ranges, mountains of Kashmir valley and Pir Panjal range, and Tibetan tract of Ladakh and Kargil. The state has a number of lakes, rivers, rivulets and glacial regions. The important rivers of this state are Indus, Chenab and Sutlej (Jhelum). There are extreme variations in climate in the state due to its location and topography. The climate of the state varies from tropical in Jammu plains to semi-arctic cold in Ladakh with Kashmir and Jammu mountainous tracts having temperate climatic conditions. The temperature of this state varies spatially. Leh is coldest and Jammu is the hottest region in the state. In the winter nights, temperature goes down below zero and very often heavy snowfall occurs during November to February. The annual rainfall varies from region to region with 92.6 mm in Leh, 650.5 mm in Srinagar and 1,115.9 mm in Jammu. Geologically, the state represents constituted rocks varying from the oldest period of the earth’s history to the youngest present day river and lake deposits. #Provisional figure of 2002 from SRS, Office of the Registrar General of India, Ministry of Home Affairs. Himachal Pradesh lies between the latitudes 30o 23' – 33 o 13' N and longitudes 75 o 43' -79 o 4' E. The state is bounded by Uttarakhand on the southeast, Tibet on the east, Punjab on the west and southwest, Haryana on south and Jammu & Kashmir on the north. It is situated in the northwest corner of the India; right in the lap of Himalayan ranges. The altitudinal variation ranges between 460 meters to 6,600 meters above mean sea level. The state is divided into three zones – the Siwaliks or the outer Himalaya, the low mountains which have less altitude in comparison to great mountains in the middle, and the zone of the Zanskar (high peaks of Himalaya). Many parts of this state are snow bound from December to April. Numerous passes and glaciers are found in this state. Most important rivers of this state are – Chenab (Chandrabhaga), Ravi (Iravati), Sutlej (Shatadru), Beas (Vipasa) and Yamuna (Jamuna). The Chenab flows 122 km inside Himachal Pradesh before it enters Jammu & Kashmir. Yamuna has a catchments area of 2,320 km2 in Himachal Pradesh. The climate of northern part or the glacial region of this state is almost cool throughout the year. In winter, snowfall continues until March and could be as high as three meters on the average. The southern part has similarity with the plains and varies from hot to sub-humid. The state experiences cold season from October to middle of March, hot seasons from April to June, and rainy season begins from July and goes upto September. Rs. 10942/- (quick estimate) (at 1993-94 prices). Uttarakhand is located between 28o 43' – 31o 27' N latitudes and 77o 34' – 81o 02' E longitudes. The river Tons separates the state from Himachal Pradesh in the north-west, whereas the river Kali separates it from Nepal in the east. The greater Himalaya is the northern boundary of the state and is also the international boarder with China (Tibet). Foot-hills in the south are bounded by Uttar Pradesh. Starting from the foot hills in the south, the state extends upto the snow-clad peaks of the Himadri making the Indo-Tibetan boundary. The region, being situated centrally in the long sweep of the Himalaya, forms a transitional zone between the per-humid eastern and the dry to sub-humid western Himalaya. Uttaranchal became the 27th state of the Republic of India on 9 November 2000, latter on renamed as Uttarakhand in January 2007. Historically, the state is believed to be the land where Vedas and the Shastras were composed and the great epic, the Mahabharata, was written. The average annual rainfall of the state, as recorded in 1999, is 1,079 mm. With an altitudinal variation ranging from 200m to more than 8,000m above mean sea level, the state comprises of five lithotectonically and physiographically distinct subdivisions namely, the outer Himalaya comprising Tarai and Bhabhar, sub-Himalayan belt of the Siwaliks, the lesser Himalaya, the great Himalaya, and the trans-Himalaya or the Tethys. The climate of the state is quite harsh particularly in winter when temperature goes occasionally below freezing point in many of the subdivisions of the state. Sikkim is situated in the eastern Himalaya between 88o 03' - 88 o 57' E longitude and 27 o 03' - 28 o 07' N latitude. It is a small mountain state bounded by Tibet on north, Nepal on west, Bhutan on east and West Bengal on south. India’s highest mountain peak Kangchendzonga (8,579 m), which is world’s third highest peak, rises from this state. The state extends to about 115 km from north to south and 65 km from west to east. Most of the areas of the state are snow covered throughout the year. Its unique geographical position, varied topography and high annual rainfall make the state a treasure house of flowering plants. The vegetation of tropical forests occurring up to 900m consists of moist deciduous to semi-evergreen tree species. Sikkim is famous for its orchids and harbours about 45% of orchid species found in the country. Tista is the main river of the state, which divides the state into north and south. The other rivers are - Lahen, Lachung, Rangit and Rangpo. The climate of this state varies with the altitudes. The upper region is extremely cold but the southern part is humid; similar to neighboring state West Bengal. Because of its elevations, the rainfall in the state varies from 500 to 5,000 mm per year. Though Arctic conditions are quite common in the higher elevations of the state, the temperature varies between as high as 30o to below 0o C with relative humidity up to 95%. West Bengal state of the country is comprised of 19 districts. Only Darjeeling district forms the hill region of West Bengal under Eastern Himalaya. The eastern frontier of the hill region lies along the rivers Tista and Rangit; beyond it is Rishi-La and Bhutan. The lower regions of the Labyrinth hilly forest-clad ridges have been cleared for the cultivation of world famous Darjeeling tea. Darjeeling district lies between 26o 31' – 27o 13' N latitudes and 87o 59'– 88o 53’'E longitudes. The region is located in very strategic position of North Bengal, which touches 3 international borders, viz. Nepal in west, Bhutan in north-east, and Bangladesh in south-east; its northern and southern boundaries touch Indian states Sikkim, West Bengal and Bihar, respectively. The altitude of the region varies from 91m in the foot hills of West Bengal, the ‘Tarai’ region in the south, to 3,657m high mountain in the north. The region receives plenty of rains and has a wide range of climates from tropical to sub-alpine. The forests in and around Darjeeling have delightful flora and fauna. Four thousand species of flowering plants, three hundred varieties of ferns including tree ferns and numerous types of flowerless plants, mosses, algae, fungi, birches, and of course, the prize orchids, wild and cultivated, are found in Darjeeling. Meghalaya lies between 25° 1' – 26° 5' N latitudes and 85° 49' – 92° 52' E longitudes. The state is bounded by Assam on its east, north and north-west and by Bangladesh on the south and south-west. The Khasi hills and Jaintia hills, which form the central and eastern parts of Meghalaya, respectively, are imposing plateaus with rolling grasslands, hills and river valleys. The southern face of the plateaus is marked by deep gorges and abrupt slopes. Water falls rush down steep slopes and carve deep valleys through which swift flowing rivers descend to the plains. At the foot of these slopes, a narrow strip of plain land runs along the international border with Bangladesh. The state has a number of rivers but none of them are navigable; the major rivers are Ildek, Dudnai, Krishnai, Jinari, Didak, Jinjiram, Mahadeo, Moheshkali and Someshwari. The climate of the central and eastern Meghalaya is conducive whereas in the western Meghalaya, except for the winter, it becomes oppressive. Meghalaya is well known for its clouds and rainfall. The Mawsynram village receives the world’s highest rainfall (earlier it was recorded at Cherrapunji in the state) on the average of about 750 cm. Assam state of the country is comprised of 23 districts. Only two districts, namely North Cachar Hills and Karbi Anglong, form the hill region of Assam under Eastern Himalaya. The hill region lies between 25o 3' – 26o 35' N latitudes and 92o 10' – 93o 50' E longitudes. It is situated at the southern part of Assam and is bounded by Nagaland and Manipur states on the east and Meghalaya on the west. The northern part of the region touches Marigaon, Nagaon, and Golaghat districts of Assam, while southern part is bound by Cachar district of the state. Most of the area is covered by hills. The Thumjang (1,866 m) is the highest peak in Borail range. Other peaks are - Hempeupet (1,748 m) and Singhason (1,360 m). The plain areas consist of valleys of the Jamuna, Kapili and Dhansiri rivers lying in its eastern part. The forests depict a high amount of landscape heterogeneity promoting greater bio-diversity. These forest areas are natural museums of living giant trees, a treasure house of rare, endemic and endangered species and medicinal plants. Due to variation in topography, the hill region experiences change in climate in different parts. Rainfall varies from 2,200 – 2,700 mm and Borail range receives the heaviest rainfall in the region. 368 km from Haflong (North Cachar hills) of Assam hills. 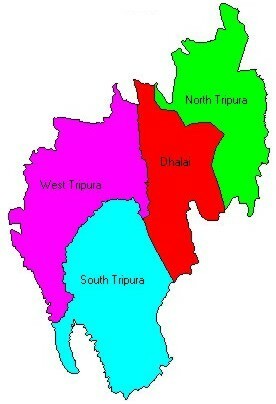 Tripura lies between 22o 56' – 24o 32' N latitudes and 90o 09' – 92o 20' E longitudes. It is one of the remotest northeastern states of India and is bounded on three sides by Bangladesh (about 84% international border) and on northeast by Assam and Mizoram. It is strategically situated between the river valleys of Myanmar and Bangladesh. The state has hills and sub-mountains in the central and eastern region. The main rivers of the state are - Gumti, Manu, Dhalai and Khowai. The other rivers are: Juri, Langai, Deo, Surma, Raima, Laogang and Mukari, etc. The state’s climate is tropical moist or warm and humid and temperature varies from 10oC to 35oC. The rainfall varies from 1,811 mm (at Sonamura) to 2,855 mm (at Kamalpur) with annual average of 2,100 mm in the state. Rs. 6813/- (quick estimate) (at 1993-94 prices). Mizoram lies between 210 58' - 240 35' N latitudes and 920 15' - 930 29' E longitudes. The state is bounded by Tripura and Bangladesh on its west, the Chin hills of Myanmar on its east and south, and by Manipur and Assam on its north. Mizoram is a land of rolling hills, rivers and lakes. As many as 21 hill ranges of different heights run through the length and breadth of the state. The terrain has variegated topography, extremely rugged leaving some plains scattered in the state. Hills in the state extend from north to south with an inclination to be higher in east to the territory and tapering in the north and south. The average height of the hills is about 900 m. Blue Mountain is the highest peak (2,210 m) of the state. Mizoram has an abundance of trees, bushes, plants, shrubs and grasses. There are many rivers in the state and some of them are the Tlawng, Tuirail, Tuiwal, and Koladyne. The climate of the state exhibits a strong seasonal rhythm. Normally the state has four seasons – winter, pre-monsoon, monsoon and retreating monsoon. Annual rainfall varies from a minimum of 100 cm to a maximum of 300 cm with an average of 250 cm. Mizoram has the distinction of having the highest percentage (94.46%) of its total population as scheduled tribe population in the country. Manipur lies between 230 80' to 250 68' N latitudes and 930 03' to 940 78' E longitudes. The state is bounded by Nagaland on north, Mizoram on south, Myanmar on east and Cachar district of Assam on west. Geographically, the state is divided into two tracts; the hills and the plains. The eastern wing of the Himalaya, specially its lower hills, constitutes an important feature of the landscape of Manipur. Some of the mountains are quite high like a peak on the Nagaland-Manipur border, which is more than 3,000 m in height. There are a number of rivers in the state; these are: Barak, Manipur, Iril, Jiri, Makru, Irang, Khuga, Chapki and Tizo, etc. Barak and its tributaries constituted the plains of the state. The state’s capital Imphal is situated on the bank of Barak river. Depending on the altitude of hill ranges, the climatic condition varies from tropical to sub-alpine. The wet forests and the pine forests occur between 900-2,700 m above mean sea level and they together sustain a host of rare and endemic plants and animal lives. Manipur is coveted the world over for some of the most beautiful and precious blooms such as orchids, which have an aura of exotic mysteries about them. Manipur is the abode of Shiroy Lily (Lilium macklinae), the paradise flower, which is not found elsewhere in the world. The state enjoys a typical monsoonal climate with variants, ranging from tropical to temperate conditions. The rapid changes in topography result in climatic changes in the short distances. This state receives plenty of rainfall; the average rainfall of the state is about 210 mm. Nagaland lies between 25o 6' – 27o 4' N latitudes and 93o 20' – 95o 15' E longitudes in the extreme north-east of India. The state is bounded by Arunachal Pradesh on the north, Assam on west, Manipur on south and Myanmar on the east. The state is tight-packed with north-south aligned ranges defined by narrow and parallel valleys. The altitude of the state varies from 100 to 3,840 m (Saramati, the highest peak), which makes favourable conditions for growing different varieties of tropical and sub-tropical fruits, vegetables and cereal crops, etc. The main rivers are: Dhansiri, Doyang, Dikhu, Milak, Zungki and Tizu. The rapid changes in topography result in climatic changes within short span of time. The foot-hill plains sheltered valleys and the hill ranges are marked with climatic contrasts. The average rainfall of the state varies between 200 to 250 cm. Rs. 8726/- (at 1993-94 prices). Arunachal Pradesh lies between 26o 28' and 29o 30' N latitudes and 91o 30' and 97o 30' E longitudes. The state is situated in the extreme north-east of India and is bounded by independent countries on three sides and by Assam and Nagaland states on one side. There are Bhutan, Tibet, China and Myanmar on the west, north-east, north and east of this state, respectively, and the Indian states Assam and Nagaland on the south. Located at the confluence of the Indo-Chinese, Indo-Malayan and Indian biogeographical region with varied physio-climatic conditions, the state falls in the climatic transition between torrid and temperate zones of the northern hemisphere. Physiographically, it includes a longitudinal belt of the Assam plains of above 150m altitude in the southern border, the foot hills, the ranges of lesser sub-Himalayas (Siwalik), and greater Himalaya (Himadri) lying parallel from south to north with altitudes varying between 150m to 7,090m; amsl. The heights of mountain peaks show a greater variation ranging from 1,829 to 7,090m, the highest one is Kangte in the Tawang district. The main ridges and spurs of the sub-Himalaya fan out to the plains mostly in transverse direction except in some places where the prominent ridges run more or less parallel to each other from west to east. The high mountains in the northern ridge remain snow clad almost throughout the year. The terrain of the state consists of sub-monatane and mountainous ranges, sloping down to the plains of Assam, divided into valleys by the river Kameng, Subansiri, Siang, Lohit and Tirap. The mighty Brahmaputra, India’s major river, enters this state from Tibet and flows into Assam from where it goes down to Bangladesh before falling into Bay of Bengal. The state is situated in the Eastern Himalaya and is the richest biogeographical province of the entire Indian Himalayan zone. The province has been identified as one of the world’s 18 biodiversity hotspots. The richness of life forms, i.e., the flora and fauna that occur in these forests presents a panorama of biological diversity with over 5,000 plants, about 85 terrestrial mammals, over 500 birds and a large number of butterflies, insects and reptiles. This diversity of topographical and climatic conditions has favoured the growth of luxuriant forests that are home to myriad plant and animal forms adding beauty to the landscape.